A longing to see the jewelry that flows through my dreams became a reality when a gift of tools and encouragement arose. The creation of pieces that reflect the past and future, that enlighten the present is my inspiration. The creation of adornments that reflect a persons inner strengths, that become part of the persons reality and a part of who they are. Our little shop is an outlet for the love we share, each creation arose from the inner feelings that this love brings forth. The recognition that love is only shared and never owned, produced the story behind each creation. From within dreams emerges reality. My reality expands to a universe with no boarder to determine what is inside or outside. The beauty and darkness of lifes' creations produces the inspiration to create, to share and to love. It gives me great pleasure to share my creations with you, may it be in the visual form, may it be in the form of the story that touches or may it be in the form of joining your reality! 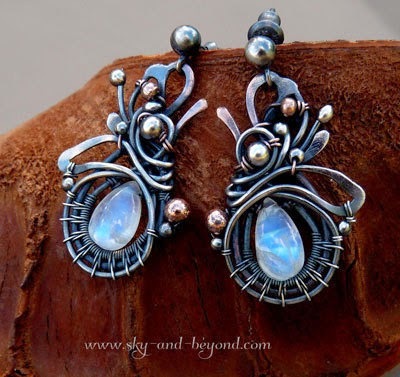 Handmade Jewelry crafted with passion, made with love !